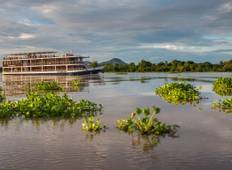 Find a River Cruise trip that explores Indochina. There are 200 tours to choose from, that range in length from 3 days up to 29 days. The most popular month for these tours is November, which has the most tour departures. "This was my 17th G tour, and I have to say, as a tour guide Bun would have to be..."
"Kim was a great guide who told us a lot of background stories about his country...."
"We had a great time. Accommodation was very good although our room at the back was..."
"I enjoyed the trip quite well. The accommodation on the boat was quite good, only..."